Trudeau tries to keep his gains in support from minorities and women by maintaining, and in some cases expanding, social programs such as childcare benefits. But the federal government is trying to do this without going overboard on the deficit–so what’s one of their strategies to make up the difference? Are they cutting their military spending? Raising taxes? Nah. They’re selling combat vehicles to Saudi Arabia. I understand and support deficit spending on make-work projects in order to dig one’s country out of a recession. But surely there’s improvements to be made at home, where we aren’t handing weapons over to an authoritarian monarchy with a shitstain for a human rights record? Seriously, at least part of the reason the Middle East is a mess is because the Americans sold them military hardware years ago. Haven’t we seen how that turns out? – He signed the anti-BDS censorship law. 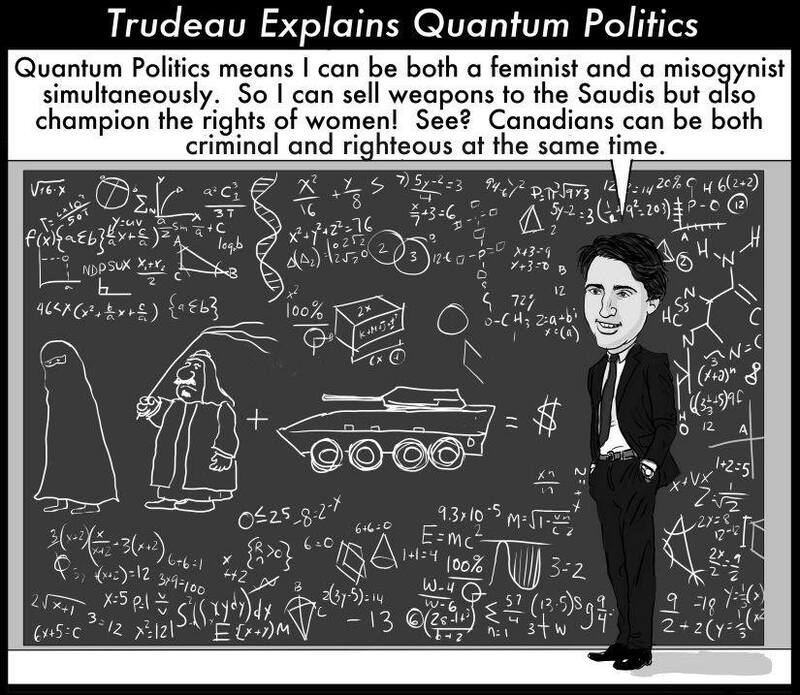 – Trudeau refuses to help Raif Badawi but arms the corrupt Saudi regime. My fellow Canadians really screwed up by giving him a majority government. A minority government (NDP or Liberal backing the other) would have been better. Trudeau could have been kept on a leash or never given power. (*) He’s even a fraud about being an SJW. He has done and said nothing to protect the rights of transgender Canadians, and has already broken promises to LGBTQIA people regarding their rights.